A fire in a cable duct after a short-circuit disabled the electrical power supply for all feedwater and emergency core cooling pumps. A power supply was improvised by the operating personnel after several hours. Operators neglected to remove moisture-absorbing materials from a fuel rod assembly before loading it into the KS 150 reactor at power plant A-1. The accident resulted in damaged fuel integrity, extensive corrosion damage of fuel cladding and release of radioactivity into the plant area. The affected reactor was decommissioned following this accident. Equipment failures and worker mistakes contributed to a loss of coolant and a partial core meltdown at the Three Mile Island Nuclear Generating Station 15 km (9.3 mi) southeast of Harrisburg. While the reactor was extensively damaged, on-site radiation exposure was under 100 millirems (less than annual exposure due to natural sources). Area residents received a smaller exposure of 1 millirem (10 µSv), or about 1/3 the dose from eating a banana per day for one year. There were no fatalities. Follow-up radiological studies predict between zero and one long-term cancer fatality. A brief power excursion in Reactor A2 led to a rupture of fuel bundles and a minor 80 GBq (2,200 mCi) release of nuclear materials at the Saint-Laurent Nuclear Power Plant. The reactor was repaired and continued operation until its decommissioning in 1992. More than 100 workers were exposed to doses of up to 1.55 mSv (155 mrem) per day radiation during repairs of the Tsuruga Nuclear Power Plant, violating the Japan Atomic Power Company's limit of 1 mSv (100 mrem) per day. An inadequate reactor safety system led to an uncontrolled power excursion, causing a severe steam explosion, meltdown and release of radioactive material at the Chernobyl nuclear power plant located approximately 100 kilometers north-northwest of Kiev. Approximately fifty fatalities (mostly cleanup personnel) resulted from the accident and the immediate aftermath. An additional nine fatal cases of thyroid cancer in children in the Chernobyl area have been attributed to the accident. The explosion and combustion of the graphite reactor core spread radioactive material over much of Europe. 100,000 people were evacuated from the areas immediately surrounding Chernobyl in addition to 300,000 from the areas of heavy fallout in Ukraine, Belarus and Russia. An "Exclusion Zone" was created surrounding the site encompassing approximately 3,000 km2 (1,200 sq mi) and deemed off-limits for human habitation for an indefinite period. Several studies by governments, U.N. agencies and environmental groups have estimated the consequences and eventual number of casualties. Their findings are subject to controversy. Spherical fuel pebbles became lodged in the pipe used to deliver fuel elements to the reactor at an experimental 300-megawatt THTR-300 HTGR. Attempts by an operator to dislodge the fuel pebble damaged the pipe, releasing activated coolant gas which was detectable up to two kilometers from the reactor. A pressure buildup led to an explosive mechanical failure in a 34 m3 (1,200 cu ft) stainless steel reaction vessel buried in a concrete bunker under building 201 of the radiochemical works at the Tomsk-7 Siberian Chemical Enterprise plutonium reprocessing facility. The vessel contained a mixture of concentrated nitric acid, 8,757 kg (19,306 lb) uranium, 449 g (15.8 oz) plutonium along with a mixture of radioactive and organic waste from a prior extraction cycle. The explosion dislodged the concrete lid of the bunker and blew a large hole in the roof of the building, releasing approximately 6 GBq (160 mCi) of Pu 239 and 30 TBq (810 Ci) of other radionuclides into the environment. The contamination plume extended 28 km (17 mi) NE of building 201, 20 km (12 mi) beyond the facility property. The small village of Georgievka (pop. 200) was at the end of the fallout plume, but no fatalities, illnesses or injuries were reported. The accident exposed 160 on-site workers and almost two thousand cleanup workers to total doses of up to 50 mSv (the threshold limit for radiation workers is 20 mSv/yr). Operators attempting to insert one control rod during an inspection neglected procedure and instead withdrew three causing a 15 minute uncontrolled sustained reaction at the number 1 reactor of Shika Nuclear Power Plant. The Hokuriku Electric Power Company who owned the reactor did not report this incident and falsified records, covering it up until March, 2007. Inadequately trained part-time workers prepared a uranyl nitrate solution containing about 16.6 kg (37 lb) of uranium, which exceeded the critical mass, into a precipitation tank at a uranium reprocessing facility in Tokai-mura northeast of Tokyo, Japan. The tank was not designed to dissolve this type of solution and was not configured to prevent eventual criticality. Three workers were exposed to (neutron) radiation doses in excess of allowable limits. Two of these workers died. 116 other workers received lesser doses of 1 mSv or greater though not in excess of the allowable limit. Partially spent fuel rods undergoing cleaning in a tank of heavy water ruptured and spilled fuel pellets at Paks Nuclear Power Plant. It is suspected that inadequate cooling of the rods during the cleaning process combined with a sudden influx of cold water thermally shocked fuel rods causing them to split. Boric acid was added to the tank to prevent the loose fuel pellets from achieving criticality. Ammonia and hydrazine were also added to absorb 131I. 20 t (20 long tons; 22 short tons) of uranium and 160 kg (350 lb) of plutonium dissolved in 83 kl (2,900 cu ft) of nitric acid leaked over several months from a cracked pipe into a stainless steel sump chamber at the Thorp nuclear fuel reprocessing plant. The partially processed spent fuel was drained into holding tanks outside the plant. Tritium contamination of groundwater was discovered at Exelon's Braidwood station. Groundwater off site remains within safe drinking standards though the NRC is requiring the plant to correct any problems related to the release. 35 l (7.7 imp gal; 9.2 US gal) of a highly enriched uranium solution leaked during transfer into a lab at Nuclear Fuel Services Erwin Plant. The incident caused a seven-month shutdown. A required public hearing on the licensing of the plant was not held due to the absence of public notification. After the 2011 Tōhoku earthquake and tsunami of March 11, the emergency power supply of the Fukushima-Daiichi nuclear power plant failed. This was followed by deliberate releases of radioactive gas from reactors 1 and 2 to relieve pressure. On March 12, triggered by falling water levels and exposed fuel rods, a hydrogen explosion occurred at reactor 1, resulting in the collapse of the concrete outer structure. Although the reactor containment itself was confirmed to be intact, the hourly radiation from the plant reached 1.015 Sv (101.5 rem) - an amount equivalent to that allowable for ordinary people in one year. Residents of the Fukushima area were advised to stay inside, close doors and windows, turn off air conditioning, and to cover their mouths with masks, towels or handkerchiefs as well as not to drink tap water. By the evening of March 12, the exclusion zone had been extended to 20 kilometres (12 mi) around the plant and 70,000 to 80,000 people had been evacuated from homes in northern Japan. On March 14, a second, hydrogen explosion (nearly identical to the first explosion in Unit 1) occurred in the reactor building for Unit 3, with similar effects. On March 15, a third explosion occurs in the “pressure suppression room” of Unit 2 and is initially said not to have breached the reactor’s inner steel containment vessel, but later reports indicated that the explosion damaged the steel containment structure of Unit 2 and much larger releases of radiation were expected than previously. On March 15, a fourth explosion damages the 4th floor area above the reactor and spent fuel pool of the Unit 4 reactor. 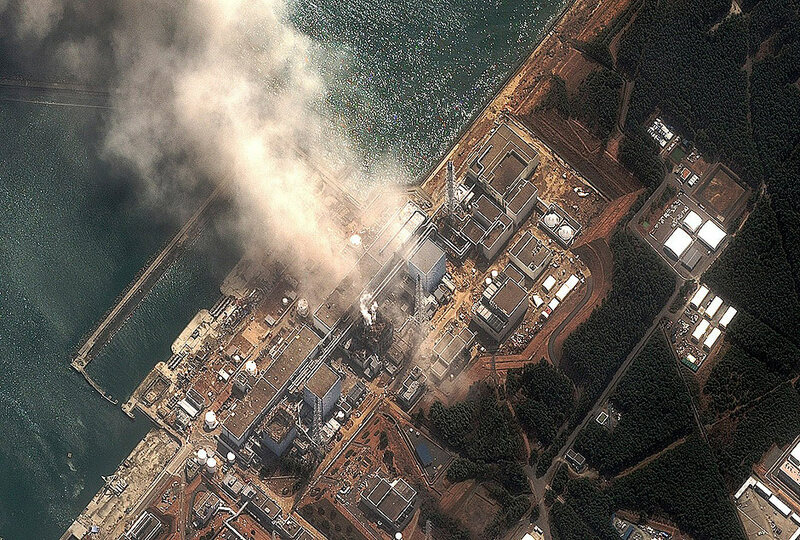 Contrary to the TEPCO press release, aerial photos show that most of the outer building was actually destroyed. The fuel rods (both new and spent fuel) of reactor Unit 4, stored in the now exposed spent fuel pool, were reportedly exposed to air – this would have risked the melting of the nuclear fuel. However later research found the fuel rods been covered by water all the time. On 16 March TEPCO estimated that 70% of the fuel in Unit 1 had melted, and 33% in Unit 2, further suspecting that Unit 3's core might also be damaged. In November 2011 TEPCO released the report of the Modular Accident Analysis Program (MAAP). The report showed that the reactor pressure vessel (RPV) in Unit 1 (commonly known as the reactor core) had been damaged during the disaster, and that significant amounts of fuel had fallen into the bottom of the primary containment vessel (PCV) – the erosion of the concrete of the PCV by the molten fuel immediately after the disaster was estimated to have been stopped in approx. 0.7 metres (2 ft 4 in) depth, with the thickness of the containment being 7.6 metres (25 ft). Gas sampling done before the report detected no signs of an ongoing reaction of the fuel with the concrete of the PCV and all the fuel in Unit 1 was estimated to be "well cooled down, including the fuel dropped on the bottom of the reactor". MAAP further showed that fuel in Unit 2 and Unit 3 had melted, however less than Unit 1, and fuel was presumed to be still in the RPV, with no significant amounts of fuel fallen to the bottom of the PCV. The report further suggested that "there is a range in the evaluation results" from "most fuel in the RPV (some fuel in PCV)" in Unit 2 and Unit 3, to "all fuel in the RPV (none fuel fallen to the PCV)". For Unit 2 and Unit 3 it was estimated that the "fuel is cooled sufficiently". The larger damage in Unit 1 was according to the report due to long time that cooling water was no injected in Unit 1, letting much more decay heat accumulate – for about 1 day there was no water injection for Unit 1, while Unit 2 and Unit 3 had only a quarter of a day without water injection. As of December 2013, it was reported that TEPCO estimated for Unit 1 that "the decay heat must have decreased enough, the molten fuel can be assumed to remain in PCV (Primary container vessel)". Here is a link toa bunch of criticality accident at USA "national labs"
And here is one a reader sent, sheesh, that was a good coverup! How often do nuclear power plants go wrong? How many accidents and incidents are there? The explosions and nuclear fuel rods melting at Japan's Fukushima nuclear power plant, following the Sendai earthquake and tsunami last week, have caused fears of what will happen next. Today Japan's nuclear safety agency has raised the nuclear alert level for Japan from four to five - making it two levels lower than the Chernobyl disaster in 1986. 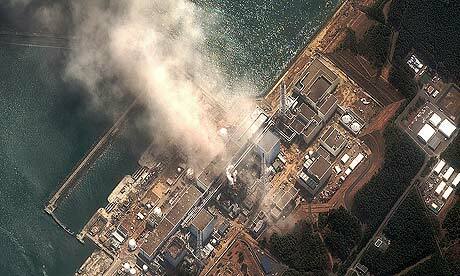 So far, the Japanese authorities have maintained that there is "no cause to fear a major nuclear accident". We have identified 33 serious incidents and accidents at nuclear power stations since the first recorded one in 1952 at Chalk River in Ontario, Canada. The information is partially from the International Atomic Energy Authority - which, astonishingly, fails to keep a complete historical database - and partially from reports. Of those we have identified, six happened in the US and five in Japan. The UK and Russia have had three apiece. But how serious are they? The International Atomic Energy Authority ranks them using a special International Nuclear Events Scale (INES) - ranging from 'anomaly' to 'major accident', numbered from 1 to 7. 1957 Kyshtym 6 Russia Significant release of radioactive material to the environment from explosion of a high activity waste tank. Great listing, thanks again for post this all this info! How about the Peterborough Tritium releases rivaling that of a full-fledged Candu NPP? Quote: "On February 1, 2010, a tritium light factory (SSI) located at the Peterborough Airport released 147 trillion becquerels of tritium to the atmosphere in about 5 minutes. This did not become public knowledge until 2012." Yeah those are good ones (in a bad way). It shows just how deep the rabbit hole goes. Lots of very unscrupulous, actually fully criminal activities, covered up by cover ups and when those fail there is also the techo babble jargon and multiple rad units and interpretation of those to cloud the issue. Thanks for the submission, I made it into a post. Fukushima is 7 on the INES level, not 5. Within 10 years, if there is still an INES, wouldn't it be forced to declare it an 8 at a minimum? Hi, I'm at a Christmas Eve party and just got shown how our www.NRC.gov radio interview on the Dr.GUY McPHERSON radio show is on all sorts of sites. The 2016 new Bio-weapons are not that likely to be used, but more so than Nuclear war. The Sept meeting in D.C. with Pope & Xi Jinping is a part of the Pope's Christmas warning message...but it is always wise for us to remember it might be the last one. Live well and safe wishes to all.